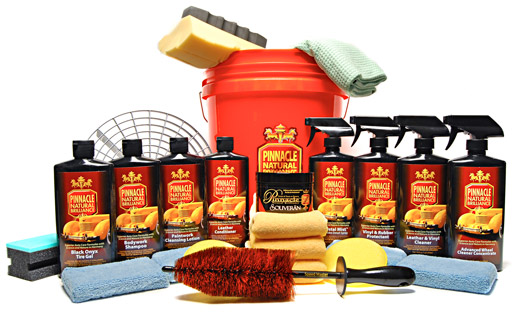 Pinnacle products are designed to be simple to use, effective and, most importantly, they are good for your vehicle. With nourishing, protective formulas, Pinnacle products create a beautiful look now and in the future. 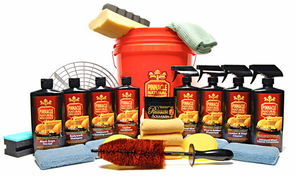 With the Pinnacle Total Interior/ Exterior Detailing Kit, your vehicle will look like it belongs on the concours circuit and you�ll look like the detailing extraordinaire you really are. Souver�n� is a hand-poured wax designed to produce the deepest wet-look shine possible in a paste wax. It is a special blend of Brazilian Ivory Carnauba and natural oils which produces tremendous depth and richness. The easy-on, easy-off formula makes waxing your vehicle as enjoyable as it is beneficial. Pinnacle Vinyl & Rubber Protectant beautifies and protects your car�s dash, vinyl seats, and door facings. Our blends of natural and modern ingredients restore the natural sheen of vinyl without that artificial plastic look. Surfaces are enhanced to a non-greasy, satin luster. Conditioning oils of vanilla and banana provide a fresh, natural fragrance. Pinnacle Black Onyx Tire Gel provides a remarkable rich deep black finish that is the perfect complement to any finely detailed vehicle. The advanced polymer formula is engineered to last and last. Treated tires will retain that rich black finish for 2-3 weeks even through a couple of washings. This large bucket is perfect for washing vehicles of all sizes. The wide mouth accommodates most wash brushes and tools. It also includes the Grit Guard that has a radial grid surface that scrapes dirt out of your mitt or sponge. Four quadrants at the base of the Grit Guard calm the wash water and hold the grid above the bottom of the bucket. Dirt falls to the bottom and stays there. The raised radial surface fits in the bottom of any 5 gallon bucket and extracts grit from your wash mitt or sponge when you drag it across the Grit Guard. The ultra-dense, extremely-soft, gold foam feels silky soft when dry and even more so when loaded with your favorite soap solution. This tightly-packed, closed-cell, foam holds a huge amount of soap and water, allowing you to flush dirt off the surface with plenty of lubricity. What's more, the Lake Country Wash Wedge easily releases dirt when submerged into a bucket of rinse water. The Supreme Guzzler Waffle Weave Drying Towel features a plush, 80/20 waffle weave that increases its surface area for greater moisture absorption. The towel can absorb 7 times its own weight in water! The Supreme Guzzler Waffle Weave Drying Towel measures 20� x 40�.That's 5 1/2 square feet of plush fabric! It's a terrific drying towel for any size vehicle. I have used several cleaning products over the years. Usually spend around 4-5 hours cleaning my cars outside/inside that's not including waxing. This kit is a must have in my opinion if you do not have supplies for the year. ConsNot exactly total interior exterior as there is no wheel cleaner.